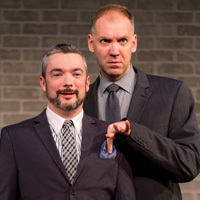 Bed & Breakfast is Ontario playwright Mark Crawford’s classic ‘fish-out of-water’ comedy about a gay couple who abnegate the stress of living in Toronto for the stress of living in small town, Ontario. Brett (Mark Crawford) and Drew (Paul Dunn) act out, with occasional narration directly to the audience, the story of renovating Brett’s late Aunt Maggie’s home to a B&B. It turns out to be more than a geographical change, as they leave behind the anonymity of a large city and are forced to come to terms with small-town homophobia (which I’m not sure really exists). Crawford (yes, the actor and playwright are the same person) serves up some hilarious madcap comedy as well as overtones of weightier elements such as blind prejudice. The show says very little that is new, but at least presents it in an offbeat way. In the end it comes down to whether Brett and Drew stay or return to their more familiar way of life. Crawford and Dunn’s performance has a closer proximity to mime than conventional acting. The show is almost totally devoid of physical props with the pair resorting to “invisible” mobile phones, photographs and coffee machines. While Brett and Drew are the central characters, the twosome also take on a slew of secondary characters with no lack of skill including: lesbian couple Alison and her Irish partner Chris, surly contractor Doug, outrageous city friend Ray and nephew Cody who too frequently utters “dunno” and cares even less. Mark Crawford and Paul Dunn (partners professionally and life) certainly have an understanding of where each other are and what each can do on stage. Crawford (the playwright) allows his partner a larger share of the more comedic roles. Ashlie Corcoran wisely goes for a generally liberal direction, allowing the performers to execute the show’s pacing - which at times may be a tad too frantic. Dana Osborne’s simple set has all the essential elements and versatile enough to seamlessly switch between the boys’ urban home with its strategically fore-shortened double bed and their newly acquired country guesthouse. The balance of humour and hubris in both the storyline and performance is just about spot-on. Though, the two-hour-plus runtime perhaps might be shortened without any loss of moxie.